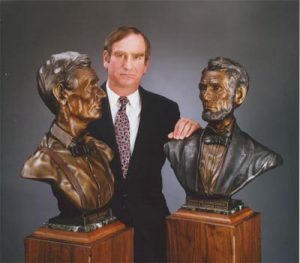 James J. Nance is a portrait sculptor who has developed his artistic skills and unparalleled reputation for the past 35 years. He has worked in studios both in Minneapolis, Minnesota, and Loveland, Colorado. His expressive and accurate portrait commissions in terra-cotta and bronze have received enthusiastic acclaim and have been acquired by both public and private collections. A Portrait of Transition: Prairie Lawyer and Immortal Conscience is the name of his project on Abraham Lincoln. It has been placed in the following institutions: The Lincoln-Herndon Law Office Illinois State Historic Site in Springfield, Illinois; The Lincoln Home National Historic Site in Springfield, Illinois; The Lincoln Museum in Ft. Wayne, Indiana; and also at The University of Tennessee Knoxville College of Law. Jim was born in Dallas, Texas, and raised in Tulsa, Oklahoma. Inspired by his exposure to western artists such as Remington and Russell, he developed an early interest in painting and sculpture. His love for aviation led him to his first career as a pilot. 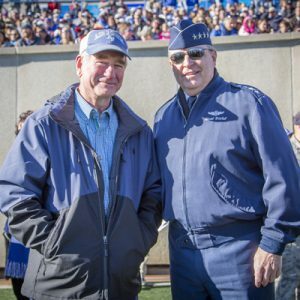 After graduating from the United States Air Force Academy in Colorado Springs, Colorado, he served a five year tour of duty as an Air Force pilot. He also served in Vietnam during this time. 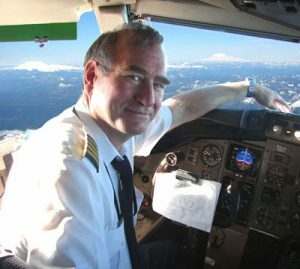 He worked as a bush pilot during the construction of the oil pipeline in Alaska, and then accepted a job with Hughes Air West Airlines. Several mergers later he ended up with Northwest Airlines where he was a senior international Captain before retiring early in 2007. Jim attended classes at both the Minneapolis College of Art and Design, and The Atelier Studio Program of Fine Art, while continuing to work for Northwest Airlines. His art education was complemented with an exhaustive study of human anatomy. Jim’s wife, Jeanne, claims that he vigorously applied his motto of “anything worth doing is worth overdoing” to his study of art. Jim always felt that the human face created a window to the soul, so it came as no surprise that he was naturally drawn to the field of portrait sculpture. His interests and talents weren’t limited to portraiture. He continued to develop his skills in figure sculpture and eventually won first place in a week-long competition at the prestigious Johnston International Live Figure Sculpture competition in 1989. This annual competition was sponsored by the International Sculpture Center of Washington D.C. His achievement led to a position as “Artist in Residence” at the Smithsonian National Gallery, and a six month study grant at the Uffizi Museum in Florence, Italy. Jim and Jeanne moved to Loveland, Colorado, in 1994 to establish his art studio, to take advantage of the thriving artistic culture in Loveland, and to be near several of the finest bronze art foundries in America. Due to time constraints with his airline job, Jim concentrated his artistic efforts primarily on portraiture in busts. Northwest Airlines filed for bankruptcy in 2005 which prompted Jim to accept an early retirement. Seizing this opportunity to reinvent himself, he began developing a monument sculpture business in Loveland. 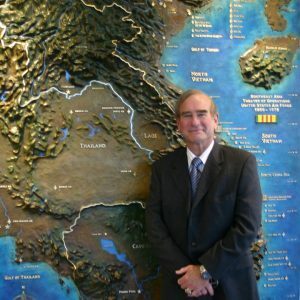 His first big break came in 2009 when the Air Force Academy commissioned him to create a large bronze relief map of Vietnam and Southeast Asia for a newly constructed Southeast Asia Memorial Pavilion. The success of this bronze sculpture map led to two other commissions from the Academy, as well as two major commissions from the Museum of Flight in Seattle. The Museum of Flight commissioned him to create a Vietnam Memorial in 2013. He completed a large bas relief in 2014 of an American POW in Vietnam and completed a bronze memorial for Captain Lance Sijan in 2015. Captain Lance Sijan earned the Medal of Honor in Vietnam. Jim’s current project is “Returning Airman” which will be placed in a new Vietnam Air War Memorial and is also sponsored by the Museum of Flight. His next project will be a bronze figure of Brigadier General Robin Olds. General Olds was a Triple Ace in both World War II and in Vietnam. Jim has sculpted the class crest for the Air Force Academy each year since 2012, as well as over 50 large bronze plaques for the Southeast Asia Pavilion. When not sculpting, James and Jeanne enjoy life with their four dogs: Beau, Kenzie, Tilly, and Miss Molly. Jim and Jeanne are also proud to be the caretakers of three beautiful horses: Wilson, Gypsy, and Zoey. Jim works from a studio at his home in Loveland. His close proximity to several bronze foundries and hundreds of support businesses places him in the epicenter of a thriving artistic culture. This abundance of community expertise and mutual support makes Jim feel confident that he could tackle any sculptural commission. He welcomes prospective clients to contact him and discuss their project.